Winners and Losers of the Pro Era – Why did England win the 2003 Rugby World Cup? It’s been 10 years since England won the Webb Ellis trophy and since then most people have put their victory down to one defining moment. You’ve guessed it! I am sure Wilkinson would be the first to deflect England’s success away from him and towards the years of preparation orchestrated by Sir Clive Woodward in the lead up to that drop kick. Woodward completely changed the job description of the modern day Head Coach in Rugby Union as he took a far more managerial role and spent years building the right support team to take England forward. He took on the post in 1997 and so was England’s first full time coach, his drive for perfection and the amount of science that went into preparing England from 1999 to 2003 is as close to the current GB and Team Sky cycling team as I think you are likely to get. There are definitely many comparisons that can be made between both Clive Woodward and Dave Brailsford who both strongly believed in ‘marginal gains’. Eerily similar to Woodward’s quote 9 years prior after winning the World Cup. Maybe Woodward was so meticulous in his planning because before he became England Head Coach he was a successful entrepreneur and set up a computer leasing company. Those in business are always very keen to get the thoughts of successful sportsmen and women who are regularly asked to be motivational speakers at company conferences. I think we need to look at it from the other side and use the principles that underlie successful businesses and business people to fit our sports teams and coaching philosophies. I am sure there are many amateur teams out there with a changing room full of business knowledge waiting to be adapted to make their teams more efficient and ultimately successful. Woodward was innovative, he created a completely new brand of rugby at HQ. Who would have thought England would play 15-man rugby and have arguably the most exciting backline at the 2003 world cup? He wanted to provide the players with a stimulating working environment. On the 1999 tour of South Africa he arranged for the Televisions to be sunk into wooden-framed boxes. To watch the TV players had to find the secret button. He wanted smart players, quick learners, players that would be able to think clearly and make good decisions. England undoubtably invested the most money of all the teams involved in the 2003 World Cup. This included their own chef, visual awareness coach and kit technician, plus experienced 5 time Olympic Gold medallist Sir Steve Redgrave who was brought in as a motivational coach. However there are some simple examples that every coach, teacher or player can take forward. Many of the ‘marginal gains’ that England Rugby made didn’t cost a penny. The ‘Black Book’ – Woodward and the coaching staff set the topic eg, punctuality, and the players formulated the rules on this topic. Therefore if there was ever an issue it was referred back to the ‘Black Book’. ‘Lombardi time’ was named after Vince Lombardi who is probably the most recognised American Football coach of all time. Players needed to be seated 10 minutes prior to pre-arranged meetings. All those involved in the team had to tow the party line and not make public any issues that took place inside the camp. Building Team Spirit – Woodward realised that spending ‘organised’ time together was not the way to build team cohesion. The players were treated like adults and were allowed to spend their free time how they wanted. Code Words – Although Woodward’s players were given the authority to ‘play’ they also had key words/phrases to express an entire strategy or a simple movement. Hit the beach – Defensive call for scramble defence to stop quick ball and a probable try. Conditioning, Injury Prevention and Nutrition – England were the fittest team in the world cup, every player had a personalised Strength and Conditioning programme and nutritional plan. S&C programmes included prehab exercises to reduce the chance of injury to weak areas of the body. They spent time stretching and warming-down after sessions and used contrast/ice baths to help aid recovery. They fuelled their body properly, not just pre game but all the time. Probably the most unbelievable statistic was that Woodward was able to choose from all 30 players in his squad for the final, he could pick his best team. How many coaches out there complain about injury problems hampering their chances of success? I am not saying that every injury is preventable but Woodward was able to ‘control the controllables’ and therefore give his players the best chance of being available and performing to the best of their ability. 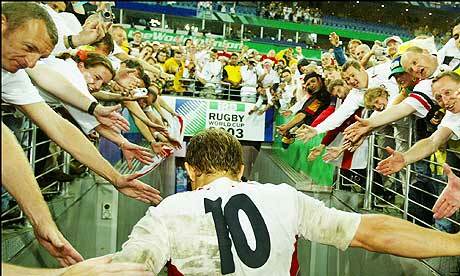 The 2003 England team became the most successful northern hemisphere side because they prepared like no other team. Woodward was innovative and a luminary in his field. He didn’t follow the handbook, his approach to the game was holistic and his attention to detail allowed him to control as many outcomes as possible. He empowered his players and encouraged them to take responsibility for important team decisions off the pitch. He had a game plan but it was not restrictive and because he spent time educating his players in the game he was confident in their ability to make the correct decisions on the pitch. What do you think? Why were England so successful? Why was Woodward not as successful with the Lions of 2005? Do you think he was integral to the success of the recent Team GB at the London Olympics? Lots to discuss!